Ecommerce business continues to move from strength to strength in Australia as consumers strongly embrace online shopping trends. More customers are attracted towards online purchasing because of the price advantage that online stores offer in comparison to traditional store based retailers. One of the main reasons that online stores offer price advantage to their consumers is that they don’t have to pay extra costs associated with physical store such as store rent, cost of labor and other utility expenses. Online stores pass these savings onto the customers and offer affordable prices. Many international companies continue to lead online retailing business in Australia. Amazon and eBay are the two largest online retailing stores. These retailing stores have made significant investments in establishing their business operations. Due to evolution in ecommerce stores, consumers have shown their interest and are actively participating in in online purchasing. Based on surveys and reports, Australian ecommerce business is growing at an exceptional rate every year. However, there are many small to medium sized businesses that have less online ecommerce stores. There has been increasing trend in online sales and that percentage is constantly growing annually, so failure to have an online shopping store means it is difficult to grow your business and sales. More and more retailers are slowly and gradually adapting to online business strategy and are interested to grab the opportunity. Traditional store based retailer’s wants to jump on the online retail business because they don’t want to lag behind in business performance and sales. When you are considering starting an ecommerce store you also have to take into account your competitors. Never imitate your competitors but look at them as a guide and provide product and services way better than your competitors. Demand for online business is huge but so is competition. Therefore, building a profitable sustainable business with differentiation is extremely important. The internet retailing stores are offering broad range of products and services at affordable pricing and convenience. The concerns for safe transactions have been reduced and consumers have become more confident in online shopping stores. By the end of 2017, the trend of ecommerce stores is expected to grow and it is going to fuel up the online sales due to ease of accessibility to the online shopping stores via mobile devices. According to current trends, it has been observed that people in Australia are increasingly engaging in online shopping. 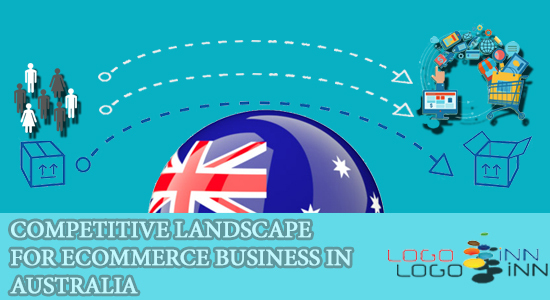 In Australia, Logoinn helps all entrepreneurs and business owners with their successful ecommerce ventures and sends them every best wish for a prosperous business.